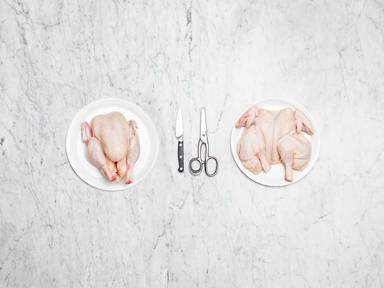 Place one whole chicken breast-side down on a cutting board and use kitchen shears to cut along one side of the backbone. Use a small, sharp knife to cut any bones or other debris away. Repeat along the other side of the backbone, then remove and discard the spine. Use the knife to remove the v-shaped sternum.Flip the chicken over and push down hard to flatten. Now it's ready to sear, roast, brine, or braise!